The Trust's first AGM on 10th April was well attended and proved to be a lively and constructive meeting with some interesting suggestions from the floor. Many thanks to all who contributed to its success. 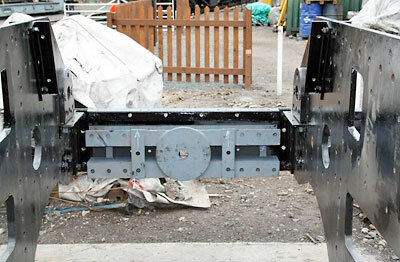 With funding in place for the completion of the frame assembly, we are now turning our attention to raising the necessary finance for the driving wheels, tyres and axles. More details including costings for this next major phase in the building of 82045 to follow. The photos to the right show the buffer beam stiffening channels in grey temporarily fitted to assist in marking out related corner brackets. Machining and drilling the flanges of the two radial arm support stretchers is underway. The U shaped clamps need to be completed and attached with fitted bolts prior to boring out the centres for the king pins. Dave Hewson in Sheffield is starting the fabrication of the pony truck centre and frame stays for front and rear of the frames. 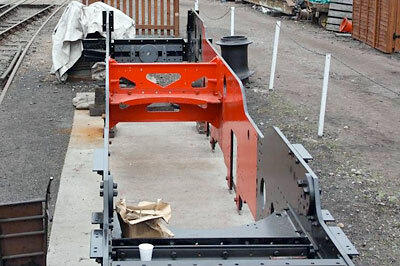 We are seeking quotations for machining these items before they arrive at Bridgnorth. 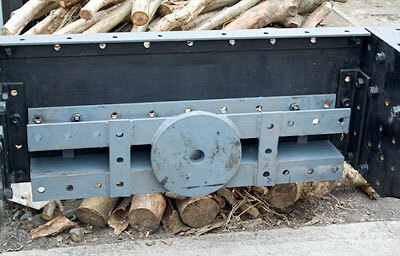 The firebox support bracket has been cast together with two brackets for a flexible frame stay. Some more in house machining to be done. We intend to move on with obtaining quotations for casting the two hornblocks and eight horn guides. Brian has made patterns for the spring bracket and brake hanger bracket castings and is now turning his attention to the motion brackets. The 82045 Steam Locomotive Trust can now benefit from donations every time you shop or renew insurance policies on the Internet and it doesn't cost you a penny more! Just click on the Easy Fund Raising banner below. Participating retailers/insurance companies are listed at the Easy Fund Raising website, for example, some insurance companies will donate as much as £35 when you renew your car insurance. Please help to raise funds for 82045 in this very easy way, we have some expensive wheels to buy! In our February newsletter we asked members if they would like to accept future newsletters by email in order to help save printing and postage costs. If you'd prefer to receive these by email, please contact the membership secretary with a simple acceptance note and we will do the rest. We became a charity on 29th January 2010 and included a Gift Aid Form in our February newsletter. Supporter's donations are currently worth 28% more to us if this Gift Aid Form is signed and returned to us, so please, if you are a UK tax payer and especially if you are a regular contributor to the Trust, just sign and return the form to the membership secretary. Remember those wheels - every little helps! As part of the SVR Music Week (the run up to The Swinging 60's weekend on 8/9th May) the 82045 Steam Locomotive Trust is hosting an evening of music on Friday 7th May under the canopy at Kidderminster. The music will be provided by the excellent Indie/pop band The Amateurs - winners of Kerrang! Radio's best unsigned song 2007. Gates open at 7pm for an 8pm start. Tickets are £10.00 adults and £5.00 children. Introducing the Trust`s youngest member! Charlie was one on 31st March and his family treated him to a day at the SVR on 2nd April where he got his hands on the frames. 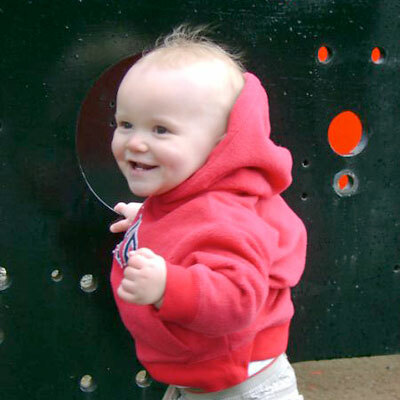 His dad Mathew enrolled him as soon as he was born and is also a member himself. We wonder who our oldest member is?